This movement is an Essential skiing ability, without it skiers are limited. Young racers should become totally comfortable using this in everyday skiing. Please feel free to respond with questions. 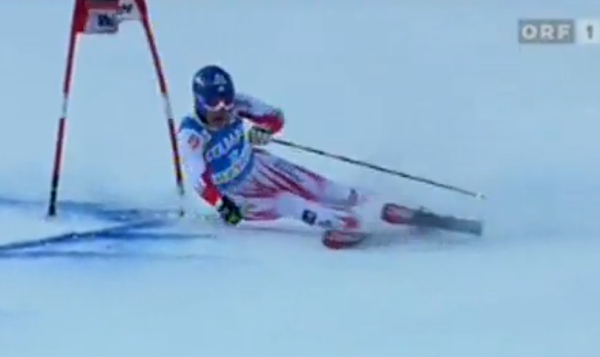 Based on and derived from: my "Essentials of Skiing" book this is the "Super Phantom Move". 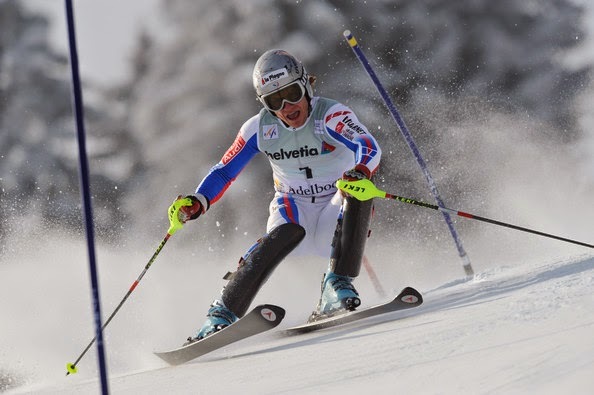 In the sport of skiing, to advance, you must learn to transfer the balance to the uphill, specifically to the outside (little toe) edge of the inside ski, to create a transition, called the "Super Phantom". This is also described in my book "Anyone can be an Expert Skier 2". Mastering this transition will take your skiing to a higher level. With the PMTS system, we teach this to all levels of skiers. It is especially helpful for those skiers still using wedge entries or in a snow plow. However, as you can see from these photos, the "Super Phantom is used to transition by the best world cup skiers. 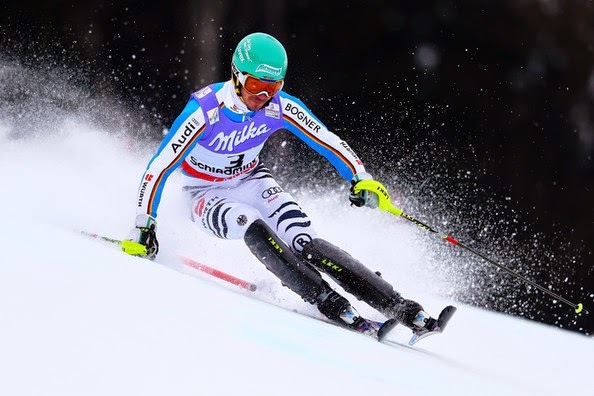 Qualities and abilities: It is obvious that all the top ski racers have the ability to transfer balance whenever needed. Sometimes deliberately or accidentally, most world-class skiers have this figured out. The first movement you need to learn is the transition. In this Check Point # 2, releasing the outside stance ski is done by relaxing, flexing and removing pressure from the outside ski and transferring it to the LTE ski. Refinement: At the point of transition, ideally, the inside ski and leg need to be tipped to the same angle as the outside ski's leg. 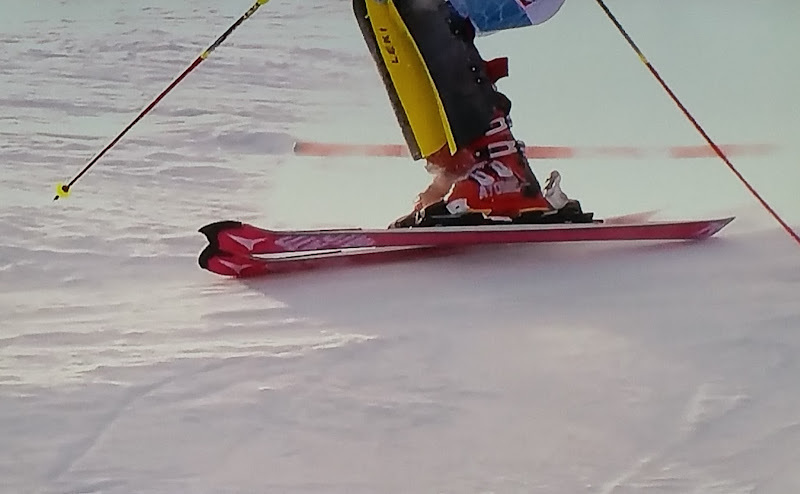 A stable counter-acted complimentary upper body and hip relationship relative to the outside ski and boot is essential at the end of the arc and, it has to be held at the point of transfer for the transition. The counteracted torso and hip should face the outside ski and be held during the release. Mechanics or Movements: Complete a round arc, finishing into the falline. At this point in the arc, change the balance from the outside to inside little toe edged ski. Hold counteracting and counter-balance, keep the inside ski angled, and the inside leg ready to support your balance shift to the "Little Toe Edge." LTE. Engage the inside ski edge, relax the outside foot, ankle, and leg, raise or lift the outside leg making the knee come up toward the chest and lift the front of the ski from the snow, then tip and pull back the former weighted outside leg. Training Objectives: All skiers participating in this training session, should be able to demonstrate to the satisfaction of the coach, stationary examples of the movements for this exercise, with ski balance changes and stance ski transferred to the LTE. Then, demonstrate and practice a traverse with total weight and balance on the uphill inside ski. All skiers should then demonstrate, first in one turn, then in a series of turns, a release with the previous outside ski lifted, for at least a ski length, before another turn is initiated. The goal is to achieve at least 5 good examples of this movement completed by all participants by the end of the training session. Quality of Movements: By the end of this training, the skiers should have numerous opportunities to demonstrate little toe edge balancing ability. And, at the same time, upper body coordination with counter-balancing and counter-acting should be maintained. The arms and poles should be held wide and pole tips should remain quiet and preferably on the snow. Benefits of this exercise and variations of this exercise: Placing the emphasis on your Balance shifting ability from one foot to the other, achieve independent balance with upper and lower body coordination. The key is to support a lower body balance change to the uphill edge while holding a counter-acted upper body relationship, while retracting the outside leg and lifting the ski. Without a solid Counter-acted relationship, which means holding the upper body and hip in place, this "Check Point" is very difficult to achieve at race speed. Notice at the point of retraction and ski lift, it's the ski tip that comes off the snow first not the tail. Footnote: All "Harb Trained" coaches have a working understanding of foot and boot needs any alignment issues directly handicap or limit young skiers from performing these types of transitions. If these exercises are not attainable it may have more to do with boot fit, alignment or correct footbeds, and is not as much a balance or technical lack of ability. I have been checking back through my copies of "Essentials of Skiing" and "Anyone Can Be An Expert Skier 2" but I cannot find specific references to the "Super Phantom Move" you discuss in this check point. I believe I have reviewed all the references to the "regular Phantom move", which seems quite distinct/opposite from the LTE uphill ski balance point described in this check point, but again I do not see specific references in either book that explain specifically address this contrasting "Super Phantom Move." Can you please point out the specific sections of "Essentials of Skiing" and "Anyone Can Be An Expert Skier 2" that address this "Super Phantom Move"? Phantom and Super Phantom are the same thing. HH explains why he added "super" below. h.harb wrote: The Phantom Move is the same thing as the Super Phantom. The only reason there is such a thing as a Super Phantom is because skiers thought they were doing a PM, but they were still pushing the uphill, old inside ski to the big toe edge, before lifting the stance ski. Therefore, I had to describe the PM in more detail and I called it the Super PM. The SuperPM puts emphasis where it should be, on standing on the old inside ski, the LTE, before the stance leg is flexed and stance ski lifted. NHSkiDad wrote: Can you please point out the specific sections of "Essentials of Skiing" and "Anyone Can Be An Expert Skier 2" that address this "Super Phantom Move"? The term "Super Phantom" is used is the ACBAES2 video. Thanks, Max, if you are using the Phantom Move correctly you don't need the Super Phantom. The Super Phantom is for those who have not accomplished or are doing the Phantom Move incorrectly. Assuming the candidate is actually attempting to do the PM... what are some of the typical things people do or don't do when attempting to do PM, that end up being deficient enough to result in a need to focus on the Super Phantom with the focus on the uphill LTE? I understand the symptoms of a poorly executed PM....stemming, out of balance, etc..
but what I'm curious about is specifically PMTS skiers....as they are earnestly attempting PM and ending up with some of the above symptoms....what is typically the fundamental move(s) they are missing or timing wrong such that they end up with problems? What is the movement they need to make sure to execute such that a PM will be "correct" without having to go to the level of thinking about Super Phantom in order to prevent the bad stuff from happening? Harald explains the shortcomings of many attempted Phantom Moves in the ACBES II video. He made the decision to create a new name to call out the true nature of the movement pattern because so many had executed the "PM" incorrectly. Good intentions and efforts aside, an awful lot of people let the new stance ski flop down on snow or lead tipping with it. The reason is that they don't succeed in transferring balance over the LTE. And being out of balance, they push to the big toe edge or twist a ski or do whatever crazy things it takes to get the ski out from under their body to get an angle. Why wouldn't a skier notice this? 1) they've never skied in balance over the LTE. 2) it feels good; it feels powerful; just doing free foot tipping even with a botched transition gives a level of control most skiers have never experienced before. Thus, they don't realize that they've left behind the main benefits of the PM -- a failed attempt at a PM can still result in the best turn a skier has ever made. Yep, I should dig that out and watch it again, its been a while... I do already understand all the symptoms you are describing...just trying to dig down under microscope to specifically what they are missing, that would lead to the need to talk and think about super phantom with the LTE focus. Well I was just wondering a bit Harald's distinction a few posts ago...he is saying the PM on its own is entirely sufficient and correct if done correctly, but if not, then they go to the Super Phantom description in order to get correct behavior. You are speaking of the focus the LTE as if the Super Phantom is the actual correct thing to do. So what is the subtle distinction between PM and super Phantom? If PM does not focus so explicitly on the LTE aspect, what would the subtle difference be? Why wouldn't you just always talk about the super phantom all the time and strive for that if its a more complete description of the pm, so to speak? In my mind its about getting balance on the uphill ski established before rolling onto the BTE, but with the super phantom focus, the extreme LTE focus is thought about, which is perhaps a bit slow in many cases, whereas a proper PM would get balance on the uphill outside ski before hitting BTE, but not necessarily on the LTE or if so, could be so brief that the skier barely notices it, while focusing on super phantom kind of forces you slow things down a little bit. Obviously if you are hitting the BTE before achieving balance on that ski, then the transfer is late and other things are probably late too. So the skier needs to learn to get those things done first before engaging the BTE...in which case they need to slow it down with super phantoms to get that sequencing...then once they start speeding things up again....it will be more like a PM because of not actually lingering on the LTE or thinking about it too much, but if they go too far back the other way and end up out of balance or stemming or the other symptoms you've mentioned, then they've lost the sequencing and need to practice more super phantoms until their sequencing is solid. The PM and the SPM are exactly the same. Two different names for the exact same thing. So many people failed to execute the PM correctly when learning from books and videos that a pedagogical reset was done. A new name and a revised explanation were introduced in an attempt to get skiers to do what had been presented all along. Harald usually only says or writes something once. You have to pay careful attention to each word he writes because it is there for a reason. Not all recreational skiers are that attentive to detail, and many came to equate the PM mainly with free foot tipping while conveniently deemphasizing the harder task of transferring balance before tipping to engage (RTE: Release, Transfer, then Engage). I always think of the Super Phantom as a drill that insures that I do the Phantom move correctly. I spend some portion of every ski day working the SP drill (making sure that I am riding the LTE for a moment or two before I start to tip the new free foot). Not sure anyone can ski well without constantly practicing and nailing this. Without the constant SP focus most get Big Toe happy very quickly. h.harb wrote: if you are using the Phantom Move correctly you don't need the Super Phantom. Its all fine, just trying to get nitty gritty understanding is all. I tend to myself focus on Super Phantom LTE focus a lot and it sounds to me from what you're saying that that is actually the more complete description of what is desired in general for the PM concept, or at least is focusing on that particular aspect of the PM in general. But I would like to hear if there would be some productive reason to rather think and discuss the previous PM description without any focus on the LTE? jbotti wrote: I always think of the Super Phantom as a drill that insures that I do the Phantom move correctly. I spend some portion of every ski day working the SP drill (making sure that I am riding the LTE for a moment or two before I start to tip the new free foot). Not sure anyone can ski well without constantly practicing and nailing this. Without the constant SP focus most get Big Toe happy very quickly. I agree, this is I think how I have been thinking about it too...but I just wanted to make sure I wasn't missing some other aspect of the difference between the two jargons. Calling the Super Phantom a specific drill, within the overall realm of Phantom Move learning....works for me. Well. (cough)...not a "drill". "Exercise"! Simple. If a student is already doing the phantom correctly they don't have to spend time worrying about the "super" in "super phantom" because they are already doing it. dewdman42 wrote: But I would like to hear if there would be some productive reason to rather think and discuss the previous PM description without any focus on the LTE? Nope. In fact, if the student has followed the progression in Book 1 and 2 correctly they will already be focusing on the LTE. We have to put our focus there because it is far too easy to got the BTE first. Phantom and Super Phantom are the exact same thing which is why many of us use either term. To max501's point about LTE focus from the very beginning, which is 1000% correct, now add tip lift to help initiate the turn. Then, add in a very strong foot pullback movement, combined with a little (or a lot) of counter balance, topped with tons of counter acting held throughout -- and you will FINALLY have the basis of a PMTS turn. For me, as a non-athletic engineer nerd, it is not easy trying to keep it all straight in my head... Actually, the movements do all flow logically. But each and every turn starts with tipping to the LTE, which is why so much emphasis is placed on the phantom move. When in doubt, use the super phantom. thanks for the clarifications everyone. My POV after reading everyone's contribution is that The Phantom Move is basically the core concept, which is more than just a single movement per say, its a number of things that need to be executed in the right order, etc..which result in the PMTS transition. The Super Phantom concept, is not a separate and distinct type of transition, its just a rebranding of the same stuff, but with a spotlight put on the uphill LTE engagement of the PM, which always should be there in PM, but the Super Phantom exercises/drills and thought process, just bring a little extra emphasis on that particular detail of the PM so that it is not skipped or missed. The introduction of the Super Phantom spotlight ultimately led to more successful learning and execution of the PM concept in that it focuses with discipline on that uphill LTE and forces the skier not to cheat, and ultimately results in cleaner Phantom Move in general. HighAngles wrote: When in doubt, use the super phantom.